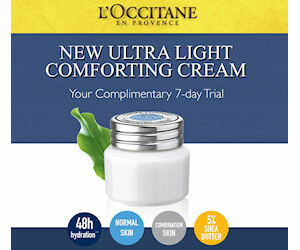 Register to obtain a free 7-day sample of L'Occitane Ultra Light Comforting Cream. Sign up through their Facebook page and they'll email you with your coupon to redeem for it in-stores at a L'Occitane boutique for free! No purchases needed!